Catalonia’s deposed president has called on Catalans to oppose peacefully Spain’s takeover of the semi-autonomous region. In a speech on Saturday from his home city of Girona, Carles Puigdemont said he would continue to work on what he called “a free country”. “The best way to defend what we have conquered so far is to have a democratic opposition to Article 155,” he said, referring to the law that allowed the government in Madrid to impose direct rule on the region. Puidgemont’s address came a day after Mariano Rajoy, Spain’s prime minister, dismissed Catalonia’s regional government, including Puigdemont, dissolved its regional parliament and set a snap election for December. 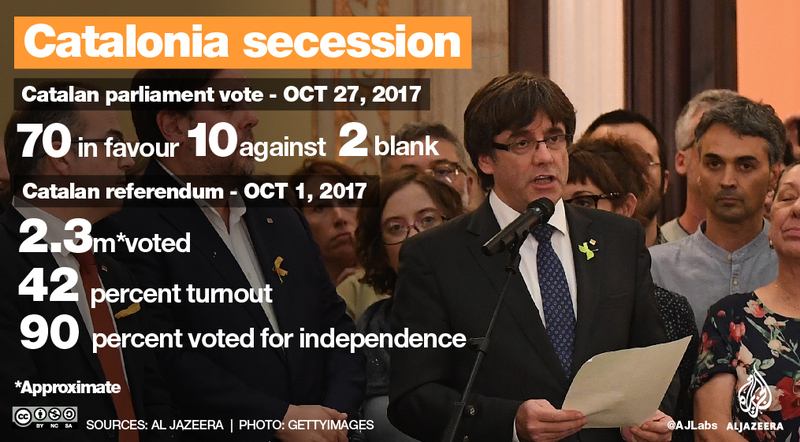 The unprecedented measures were taken in response to the Catalan parliament voting in favour of splitting from Madrid and establishing an independent republic. Leaders from Europe and elsewhere have largely stood behind Spain’s central government. In a televised statement, flanked by a Catalan and the EU flag, Puigdemont accused Madrid of “premeditated aggression” and said Catalonia would persevere “without violence, without insults, in an inclusive way”. Only the regional parliament could elect or dismiss the regional government, he insisted. Thousands of Spaniards rallied in Madrid calling for national unity as Puigdemont spoke on Saturday. 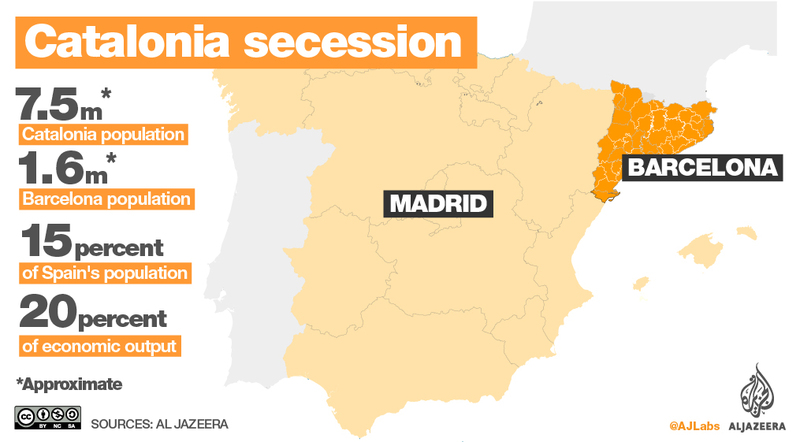 The crisis began when Catalans voted to secede from Spain in an October 1 referendum that was declared illegal by Spanish authorities. Al Jazeera’s Andrew Simmons, reporting from Barcelona, said it was evident from Puigdemont’s address that he and his cabinet intended to stay in office. The Catalan public, divided on the issue of secession, “are confused and not quite sure what will happen next”. Soraya Saenz de Santamaria, Spain’s deputy prime minister, who has been put in charge of Catalonia, has announced that she will appoint a “series of delegates” to administer the region until elections take place, our correspondent said. “As for the interior ministry, appointments are being made and sackings are taking place, particularly in the police force,” he said, noting that Josep Lluis Trapero, the head of the Mossos d’Esquadra, has been dismissed from his position. “The police force, a 17,000-strong body, are now all under orders to be professionally neutral and could be ordered to intervene during unrest. Rajoy has said that Catalonia’s declaration of independence is unlawful. The Spanish Constitutional Court is reviewing the regional parliament’s decision and the prosecutor’s office said it will file rebellion charges against Puigdemont, an offence that under Spanish law carries up to 30 years in prison.